During your growing your growing years as a juvenile, i am quite sure you must have looked in the mirror and declared with so much confidence that "you will never have wrinkles or pimples on your face". But when you reached puberty, during your early years as a teenager, it turns out to be a different story. You are not alone in this experience. Acne does not only affect teenagers. In fact, many people are plagued by adult acne when they are in their early 30s, 40s and even 50s. Looking at the report with care, you may have noticed something about the numbers. They are much higher in women compared to men. That is probably because at any age, acne is hormonally related, and the fluctuations of a woman's cycle can trigger its breakouts. What Are The Differences Between Teenage And Adult Acne? This question might probably be ringing in a bell in most of our heads, now let us look at some differences. In teenagers, you will mostly see hundreds or thousands of tiny bumps, blackheads, or whiteheads on the skin of the face, especially at the forehead, with some occasional cysts on the chest and at the back. This is because a teenager's skin tends to be a little stickier an they are more likely than adults to get clogged. In adults, acne is more likely to appear on the lower part of the face, especially around the mouth and jaw-line. It is usually a deeper nodules or red papules in those areas. The fine little bump of teenage acne can still happen in adulthood, but it is much less common. 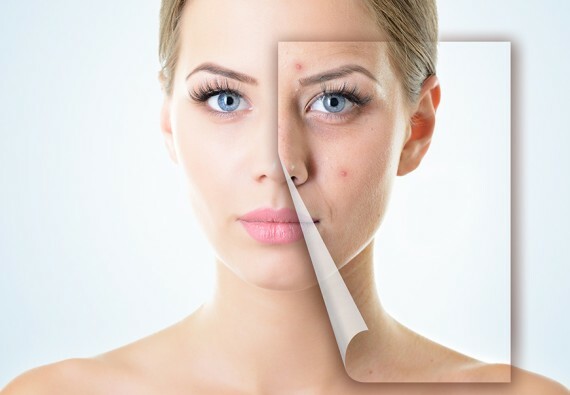 What Can Adults Do About Acne? When you eat a lot of chocolates or junk foods, that does not necessarily mean it can lead to or cause acne. But when you do not eat a balanced diet and at the same time you are consuming lots of refined carbs, it can actually lead to a problem. In a study conducted in 2007 n Australia, the researchers discovered that people who followed a low glycemic index (GI) diet (which particularly comprises of low refined carbohydrates like those found in white bread) had a 22% decrease in acne lesions, compared with a control group who consumes foods of high GI. The Scientists suspected that raised insulin levels from the carbohydrates may trigger a release of hormones that inflame follicles and increase oil production. A 2006 study conducted in Harvard found out that girls who drank 2 or more glasses of milk on a daily basis had about 20% higher risk of acne compared to those who had less than a glass of milk in a week. Another study carried out in 2008 suggested that fat-free milk in particular, which is higher in sugar than whole milk, might be the actual cause. If you are a lover of fat-free milk and you drink it regularly, you might consider switching to 1% milk or non-dairy nut milks. Blue light rays are powerful rays which penetrate follicles to kill off acne-causing bacteria. Note that this treatment can cause temporary redness and may not be covered by insurance. Aldactone (spironolactone) is a drug that have been long used in the treatment of high blood pressure, it is now also used as a treatment for acne. It is a tablet that is taken orally. The drug blocks receptors of the hormone androgen, helping to limit the testosterone surges that can trigger the formation of pimples. The tea tree oil is well known for fighting mild to moderate acne outbreaks. The oil originated from the leave of a tree which is native to Australia. It has antiseptic properties that helps fight acne-causing bacteria found on the skin and also reduces inflammation in the skin cells. Tea tree oil is normally found in varieties of soaps, skin washes, and topical solutions. All you have to do is to search for it in the label containing the ingredients the product is made up of. Preferably look for a minimum concentration of 5% of the oil. Some doctors suspects that sodium has a detrimental effect on your skin, because the iodine frequently found in the table salt and some seafood may worsen acne breakouts. Reduce your intake of salt and stick to low-salt version of packaged foods. Stress does not actually cause a skin disease on its own, but it has the capacity of making an existing skin issues to become worse. Researchers have not actually established a relationship between stomach churning anxiety and skin blemishes. but they are actually pointing a finger at stress hormones such as cortisol for increasing inflammation levels in the body and stimulating oil glands. If you want to manage stress, you can adopt exercising, meditation, or whatsoever method that can help to keep your nerves calm and also keep your skin healthy. If you are having a mild to moderate acne, dermatologists often suggest you use a cleanser with anti-bacterial benzoyl peroxide (to minimize irritation, use 10% strength), along with a prescription topical antimicrobial such as clindamycin or erythromycin. Stronger cases of acne might call for prescription retinoids. Because retinoids also have anti-wrinkle properties (they help stimulate collagen production), they can be especially beneficial as acne treatment for adults. Birth control pills such as oral contraceptives can help normalize hormonal surges and regulate monthly cycles so that oil glands do not go into overdrive. Among the popular over-the-counter remedies for acne is salicyclic acid, which is incorporated into wipes, gels, sprays and creams. The acid reduces swelling and redness and unplugs pores. To prevent your skin from becoming too dry, look for formulas made for adult women and not for teenagers (aim for 2% salicyclic acid to start). Adult acne will definitely be a thing of the past when you follow these 10 highly effective acne treatment for adults. Kindly share you contributions by using the comment box below. I suffered with bad skin in my youth and it really isn't nice. There are so many things you can try to manage it, it really is trial and error. But you will eventually find a perfect solution with time. What do you think Ling? Recently I Bought dermalmd blemish serum at my dermatologist's office and it worked wonders! I was getting adult acne and my skin felt and looked horrible. Dermalmd seum left my skin feel soft to the touch and clear! It's even helping with the blemishes. I found this on google for half the price! I recommend dermalmd for women getting menopausal acne. Works great!